To celebrate this we decided to chose an entire series of book, rather than just a single title. 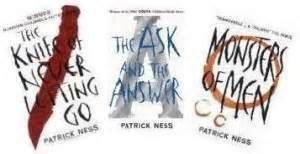 The series that held this honor was none other that The Chaos Walking series by Patrick Ness. We all agreed that this was an amazing set of books and we gave them a whopping five out of five stars!! Yep, I think it's safe to say we liked them lol. I approached this book with high expectations which were mostly exceeded. The range of characters and the world in which they resided was not only likable but also extremely descriptive and believable, meaning I was drawn in quickly. I found the constant running slightly monotonous at times but overall I loved this book and am looking forward to starting the next book in the series. ﻿This series really made me think about all the “what ifs” of migrating to another planet. What if we could hear each other’s thoughts? What if something went horribly wrong in a fragile, new society? It really made me think of the importance of staying true to yourself and your beliefs and the importance of having friendship though the times when you’re not sure about the world you live in, or who you are as a person. Overall, this series has got to be one of my top five as it is so different to a lot of current young adult books and is really worth a look at, even though some parts of the first book are quite slow. This is a series that could potentially change the way you look at people, so just give it a go. In Prentisstown everyone can hear each others thoughts, there is no privacy, there are no secrets, just noise. Todd Hewitt is just thirty days away from his 13th birthday, after which he will no longer be the last boy in town, but a man. But when he stumbles across a small patch of silence, he starts to uncover the truth... Prentisstown has been lying to him. Here he finds the source of the silence, a mute girl, now Todd must run if he is going to survive. A fast paced, exhilarating novel that will take you on a white knuckle journey that will break your heart﻿. I really didn't think I was going to overly enjoy this book. I thought it was going to be a bit young for me if I'm honest. It took me 30 or so pages to get into the flow of things but when I did, well, I just couldn't put it down. I loved the pace and characters and the story was completely unique to me. I LOVED Manchee even though I will never look at a dog in the same way again. I imagined him to be similar to the dog from Up! I have not suffered heartache from a fictional pet since Hedwig! I like Todd as well, the main character. I thought that for his situation he was incredibly realistic and I liked his innocence. I enjoyed watching his feelings for Viola blossom as well! The only part of the book I wasn't keen on was when Todd killed a Spak :'( I thought that the character Aaron was similar to a nineties serial killer! Quite frankly, I loved it. I loved the way Todd changed throughout the series, from a boy to a real man, not just someone who kills. I loved the way the mayor's character actually made you think, especially in the third book. Viola was a good character she just felt unnecessarily annoying and pompous at times. Our book for next month is The 5th Wave by Rick Yancey. I am SO EXCITED about this one!! We recently went to meet Rick at Penguin HQ and we loved him. We will be meeting on 11th July from 7-8pm in the Costa Coffee store behind Waterstones in Bluewater. Come along and meet the gang. I can promise they're all very nice!